JUNE 19-20, 2015 – Alas Oplas and its alliance firms revisit their businesses through a 2 day strategic planning at Summit Ridge, Tagaytay City. The two day event was spearheaded by the Founder, Chairman and CEO of Alas Oplas Mr. Donnies T. Alas and Managing Partner Ms. Marycris Oplas. Day 1, Alas Oplas Alliance Firms’ Partner and Managing Directors opened the 2 day session with their individual business plan following the Right Brain Business Plan written by Jennifer Lee. From Oplas Head Office – Ryan A. Sabug, Alas Oplas Cavite Branch – Glesie R. Martinez, Business Set Up & Compliance – Racquel O. Villarante, G Cross Systems & Process Inc. – Neth B. Cambiador, Payroll Master Process Inc. – Jenny Cabello-Catapang and RRU Management Reporting Inc. – Joan Silverio, Creativity coupled with business intelligence were apparent in their respective presentation. Company projections in the next three years focusing on their current and future needs to pull in their overall business goals were discussed. Day 2, Alas Oplas Audit Planning represented by Seniors (Jumel A. Luggui, Loraine San Pedro, Jovani Batad, Iller Anne Anisco, Wim Bunagan, John Francis Alita, and Ellen Melad). 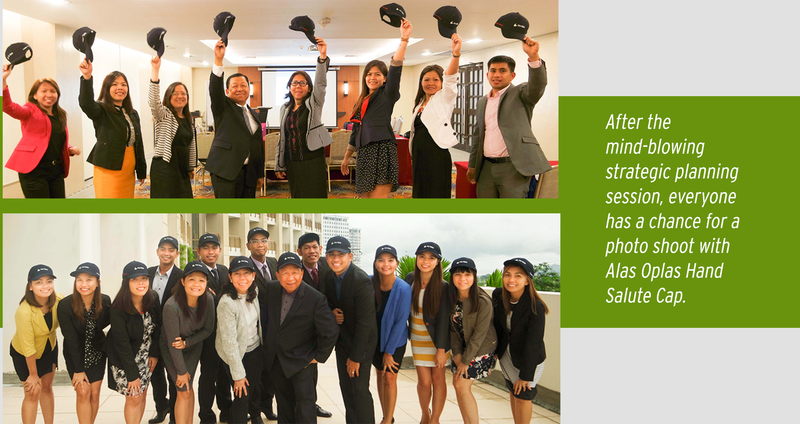 Being trained as Alas Oplas & Co., CPAs’ future leaders, each senior were given the opportunity to present their individual business plan for the Firm. From their own perspective, they tried to emphasize the need for comprehensive staff development program, among other areas, to stabilize the Firm and ultimately withstand competition in the industry. To close the 2 day session, Mr. Alas, being the CEO and Foundaing Chairman, has shared his Succession Plan for Alas Oplas & Co., CPAs.